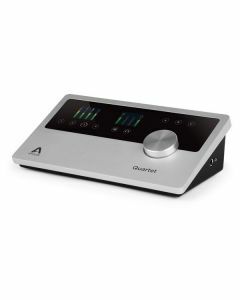 An elite desktop recording experience is dispensed to any iPad or Mac-based studio by the Apogee Quartet’s expert audio interface. The opening between the 2-channel Apogee Duet and Apogee’s flagship interface Symphony I/O is proficiently filled by the Apogee Quartet by utilising four inputs and eight outputs of Apogee’s industry-leading AD/DA conversion technology, as well as four outstanding mic preamps. Professional operation for iPad use along with low latency USB 2.0 performance for Mac is provided by unique circuitry exclusively designed for the Apogee Quartet for iPad and Mac. A Core MIDI compatible keyboard-controller can be linked to your Duet using iPad or iOS device thanks to Quartet’s MIDI I/O connector. 25 years of practice and expertise make award-winning manufacturer Apogee an industry leader in digital recording technology. Fundamental in crafting countless Grammy and Oscar winning recordings, Apogee products like Duet, Ensemble and Symphony I/O are the first choice of recording pros on a global scale and have set the industry benchmark in professional recording for over two decades. The Apogee Quartet finds its foundations firmly planted in this reputation.